Gentian is a kind of plant that belongs to the gentian family. Gentians can be small, tiny plants or very large trees, and everything in between. There are over 1600 species of gentians in the world. Gentians are very bitter so not many animals eat them. The most bitter chemical substance on Earth comes from a gentian. What does a gentian look like? All gentians have flowers and fruits, because they are flowering plants. They can be trees, shrubs, lianas, or herbs. They have leaves that sit on the stem in pairs, opposite each other. The leaf edge is always smooth. 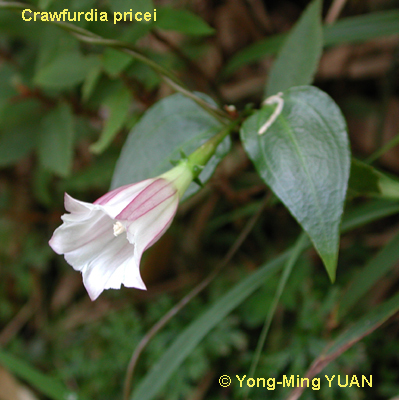 Usually their flowers have sepals at the base that are fused into a cup, and petals fused at the base to form a bell-shaped or trumpet-shaped tube, the corolla. The stamens, the parts in the flower that have pollen in them, are on long stalks and are attached to the inside of the petals. The ovary, the part that will become the fruit with seeds in it after pollination, is a slender thing in the middle of the flower that you can see well, and it has one style on top. On the very top of the style are two sticky small lobes that the pollen lands on, called a stigma. Where can you find gentians? You can find gentians on all continents of the world, except Antarctica. But they are usually not common so they can be hard to find if you don't know where to look. They like sunny spots like mountains, meadows, and savannas, but some grow in the deep dark rain forest. Gentians are very hard to grow because many of them live in symbiosis with fungi in the soil. Some of them you can grow in rock gardens, and a few species are cultivated and sold in flower stores as pot plants (Prairie Gentians and Persian Violet, for example). Never dig up a wild gentian, it will not survive in your garden or inside in a pot. Instead, buy a gentian from a flower shop. Unfortunately even the potted gentians from stores die after a little while and never lives for years. What are gentians used for? Many gentians are used by people as herbal medicines. They pick the plants, dry them and make them into medicines for fever, malaria, snake bites, infections, and stomach aches. In some countries people put gentian plants in alcohol and make bitter drinks from them. Gentians are studied by several kinds of scientists. 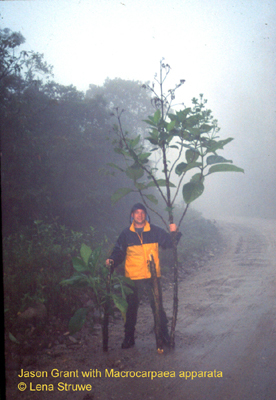 Botanists study the wild species and their evolution, how they have changed through time and become different species. Botanists also describe new species and work in laboratories to look at the DNA and detailed characters of different species. This web site is made mostly for botanists and other that are interested in wild gentians. Other scientists studies how gentians can be used as medicines and what chemicals that occur in them. There are also some scientists that try to breed gentians so they become even prettier and can be grown and sold easier. Field botanists and ecologists study how gentians grow in the wild and what can be done to protect their habitats so they will not die out. Why should we care about gentians? There are many kinds of gentians in the world, but most gentians only grow in a very small area. They grow nowhere else in the world. Therefore, if they go extinct there, they will be extinct all over the world. Gentians also have evolved for a very long time, maybe 60 million years, so they were on Earth long before humans. They have evolved into a diversity of shapes and colors together with their environment and animals in that place. Which gentian is the smallest? The smallest gentian can barely be found. There are several gentians that are very tiny. 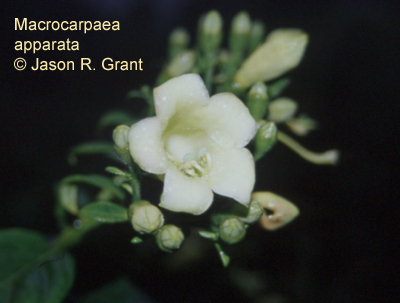 One of these is called Comastoma tenella, and is named after that it is so tiny (=tenella). It grows in the Arctic, where the summers are really short and it lives only one year. Which gentian is the largest? The largest gentian must be the rain forest trees in the Fagraea group. They grow in Southeast Asia and can be up to 30 meter (100 feet) tall. That is as tall as about twenty kids on top of each other. These trees have very good timber that doesn't rot in water and therefore people use them as poles for their houses that stands on poles in flooded areas. What colors can their flowers be? Gentian flowers can be all colors of the rainbow. And white, brown, and black too! Many people think that gentians are mostly blue, but that is only the common color in the Gentiana group from the Alps and Himalayas. Why is it called gentian? They are named after King Gentius who lived during the time of the Roman Empire in what is today's Albania. One story is that he was the one that found out that gentians can be used at medicines, but gentians probably had been used long before then by people in Europe and Asia. Are there any famous gentians? Well, maybe no gentian is as famous as Harry Potter. 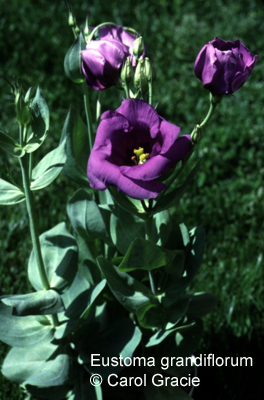 But there is a gentian named after Harry Potter's adventures, the Apparating Moon-gentian from South America. Click here to see photos or to read more. 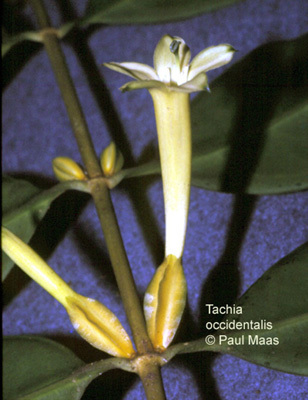 The Apparating Moon-gentian, Macrocarpaea apparata,,found for the first time in the mountain rainforest in Ecuador in 2001 by Jason R. Grant (on the photo) and Lena Struwe. Why do gentians have Latin names? Every species on Earth has a Latin name consisting of two words, like Homo sapiens for humans. The first is the genus name, which is the group the species belongs to, and the second is the species name. They are often written in italics (cursive). Two different species never have the same Latin name combination - all Latin names are unique. Latin names are used all over the world by scientists. That way scientists can talk about the same species, even if these species have different names in French, English, Spanish, or Chinese. Latin names often tell something about a species, for example Gentiana lutea is named lutea after its yellow flowers (lutea =yellow). People have named species after places and people too, and here is a cool web site by Mark Isaak explaining funny Latin names. ¨ how do gentians look like? Astrid, 10: - "Because they look funky. They have funky colors. They come from odd places. 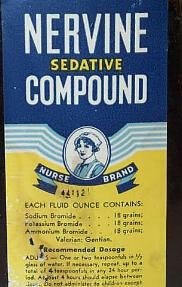 They can be used in many ways, for decorations and medicines. They have funky names too." Leif, 9: - "They are blue and their petals look like hair with weird shapes." (Leif was talking about the fringed gentians, see below). "If I could name a plant it would be called astridation in English"
"Moxie is a piece of heaven. 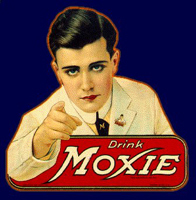 Moxie is a gentian soda. They grind up gentian roots and put it into the soda." - Do you have a favorite gentian? Astrid, 10: - "Apparata, because I like Harry Potter books."